It's traditional that every birthday I take a numerically significant bus journey, and my half-century is no exception. Eight years ago I took the 42 to Dulwich, seven years ago the 43 to Barnet, six years ago the 44 to Tooting, five years ago the 45 to Clapham, four years ago the 46 to Farringdon, three years ago the 47 to Bellingham, two years ago the 48 to Walthamstow and last year the 49 to Battersea. This year, for my sins, it's the 50 to Croydon. Rest assured that I didn't make this journey yesterday, I had better things to do, so what follows is a report from my very-late forties. On arrival at Stockwell tube station, I note that the ticket office is scheduled to be shut for good on the very day of my 50th birthday. I take this as an omen for my journey, and not a good one. My bus awaits across the road, in hibernation at the stand outside the Post Office. I pause to take a photo, because today's post requires illustration, and am promptly spotted by an astute reader. I don't work this out immediately, it's only after I've crossed the road and checked my phone that I notice they've left a swift comment on my blog. "Haha! 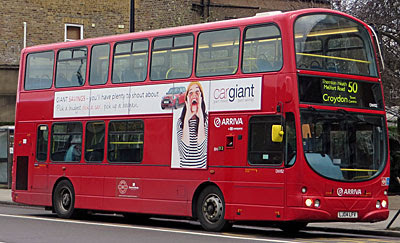 Just spotted you in Stockwell taking a photo of a number 50 bus!" Has it come to this, whoever you were, that I can now be identified in real life purely by the subject matter of a photo? But yes, bang to rights, well done, because who else in London could it be? Very few of us board at stop number one, but I'm joined on the top deck by a middle-aged gentleman who appears to be talking in a foreign staccato language. As we head south towards Clapham it slowly dawns on me that the man is indeed speaking English but with a strong West Indian drawl, and that the short sentences are because he's rapping out loud to pass the time. As a special birthday bus treat I'm getting my very own performance in verse from the back seat, which would be fine if the bloke had talent but alas I'm unconvinced. He rhymes 'tree' with 'poetry' and 'irie', and if his lines don't scan he simply adds a swear word or three to fill the gap. "I come from the line of the Sun" he chants, to the bemusement of latecoming passengers, "eff the wicked things I've effing done." I'm increasingly certain that not all of this is improvisation, and that maybe he performs in local clubs to a paying audience, but with every passing minute I'm less keen to be one of them. Clapham's High Street goes on for a while, with its mix of social services, refreshment outlets and quite nice shops. Sainsbury's occupies one of the more new-fangled buildings, architecturally speaking, while Byron hamburgers have taken over a Tudorbethan classic and painted it a most off-putting shade of green. We then spend a couple of minutes beside the Common. It's busy with clusters of footballers engaged in serious kickabout and panting joggers clearly hating every minute, while the ducks in the roadside ponds simply float and watch. At one pedestrian crossing the lights change quickly so our driver slams on the brakes, causing an empty can of Stella to emerge from beneath one of the seats and roll about. In the absence of a litter bin the man beside me picks it up and places it on top of the grab bar across the front window, where it remains safely out of harm's way for the rest of the journey. As the Common ends we turn left to cut across from Clapham to Streatham. This involves a run down Cavendish Road, which seems a fairly normal avenue of tall Victorian townhouses until you spot the road signs. Blimey, this residential road is part of the A205 South Circular, a world away from the multi-lane North Circular, and routed this way for lack of any better alternative. I recognise the area as the terminus of the number 45 bus, which I rode five years back, although I don't remember seeing any food banks in the vicinity at the time. The 50 is the only bus down King's Avenue, threading through pleasantly residential streets to climb slowly towards Streatham Hill. We wait longer than expected at the lights to join the main road, sandwiched between Porky's Wine Bar & Brasserie and a pile of rubble that used to be something commercial. Streatham High Street is the longest high street in Europe, so the banners on the lampposts say, although they spell LONG with thirteen 'o's for added impact. And they're not joking, it goes on and on and on. Thankfully it's not an especially chain store street either, so there's plenty of variety, including some original parade buildings bedecked with cupolas at rooftop level. One grand building looks like it was once a cinema, another still is, although not everything has architectural style. The new mega-Tesco and ice rink combo, for example, hugs an old church the developers clearly wish hadn't been there, but which will undoubtedly survive longer than the bland boxy buildings now surrounding it. As for the green slopes of Streatham Common, they're completely empty apart from a large flock of seagulls, it being a bit bracing for picknicking and not flat enough for football. And yes, our rapper is still in full flow. He eased off a bit as the top deck became fuller but seems to have regained his confidence of late, and is now extemporising angrily on an Ice Age theme. "Thirty thousand years ago," he growls, "man went in black as coal and he come out albino." I think the words rhymed better when he did it, but they still didn't necessarily make any sense. "Shubbadabba shubbadabba doo," he adds, which has become a particularly common cop-out when he has half a line to fill. By now I'm both grimacing and delighted, the latter because I know I'll be able to get two paragraphs out of him when I write this up, but am mightily relieved all the same when Norbury arrives and he finally shubbadabbas off. I've been wondering for a while why 'Melfort Road' has pride of place on the 50's front blind, and soon I have my answer. We turn off up a mile-long street alongside the railway, to one side Norbury Road, to the other Norbury Crescent, which swiftly becomes Melfort Road. Parked cars make it narrow, hence other drivers aren't entirely delighted to discover a double decker bearing down on them, and generally have no chance to argue. As the gabled semis sweep by, a new loudmouth kicks off from the back seats, this time a bloke berating his girlfriend in public for her inadequacy. "Are you effing dumb, how dare you say that to me?" he effs, and I wish she'd eff him back and storm off, but their relationship lingers on. I've somehow never been to Thornton Heath before, I realise, at least not the main street past the station. I'm not immediately keen to alight. It's 2pm, and the streets are full of scarved gentlemen (and ladies, but mostly gentlemen) setting off for the match at Selhurst Park, or sitting outside the Prince George on the corner with a pint and flicking through the day's programme. The traffic slows here, allowing plenty of time to peer down at two gents getting a £4.99 haircut, and peeling posters for the long past Thornton Heath Arts Week. What looks like the former telephone exchange is now a Job Centre, such is life, but still with a modernist 1953 sculpture perched on one side. The curving high street's a bit shabby, all told, but also more characterful than than the highrise heart of Croydon that's coming next. The stream of red and blue continues, overseen by a pair of horseback cops with as yet nothing much to do. A different kind of football is underway on Whitehorse Road Rec, the pumped-up shoulderpads and US-style helmets I suspect belonging to the local London Warriors. By now our bus is full of shoppers, accumulating for a trip to the Whitgift, which is accessed down an angular glass canyon of Manhattanish real estate. 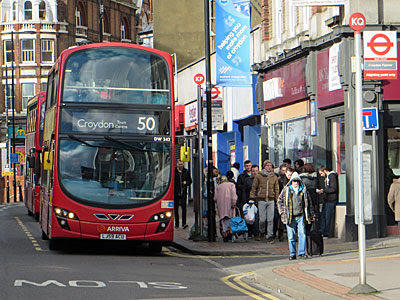 If Croydon is reinventing itself, it's not necessarily doing it in an attractive manner. Our bus's destination is officially given as 'Town Centre', but few stay on for the last two stops south of the main shops. The High Street's more for food and restaurants these days, and Grants Department Store sold its last Lace Gloves, Silks, Dresses, Mantles and Linens thirty years ago. The 50 terminates just before the Croydon Flyover, where just three of us alight, then turns up the concrete sliproad to await the next trip north. Nobody recognises me this time as I pause to take a photo of the next bus along, although I suspect I do get some strange looks hanging around on a traffic island outside the Buffalo Bar & Grill. And as I walk back to the station for the non-bus ride home, I notice with some trepidation that both the 60 and the 75 also pass this way, and hence it seems I'm doomed to spend every milestone birthday touring the Croydon one-way system. The town and I may be looking somewhat worse for wear by 2025, and best not even consider 2040.